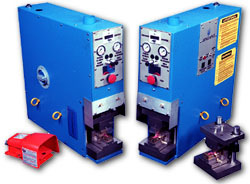 The DS-95 Jenzano Splice Welder is a versatile machine that can serve as a standard projection welder or a spot welder. With variable force control and a sleek table top design, this machine exemplifies "low maintenance." Machine weight (approximate): 250 lbs.